Chef Bruce Riezenman is the guiding force behind Park Avenue Catering, the most highly regarded catering company in the North Bay. 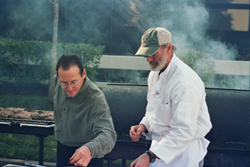 Bruce’s career began at the Culinary Institute of America in Hyde Park, NY where he graduated in 1979 with high honors. Originally from New York City, Bruce was Chef/Owner of the New Deal Restaurant (Manhattan). After moving to California, he opened Prospect Park Restaurant (Santa Rosa) and Buona Sera Ristorante (Petaluma). His expertise has made him the most requested chef of California's most discerning wineries. Since 1989, and the beginning of Park Avenue Catering, Bruce has applied his unique style to craft remarkable events, from galas for thousands to intimate dinners for a few guests. His expertise has made Park Avenue Catering one of the most requested catering companies of California’s most discerning hosts. His list of clients includes the area’s top wineries, venues, corporations and individuals. Bruce is one of California wine country’s top authorities on entertaining and on food & wine pairing. Inspired by the natural luxury of wine country living, his distinctive style centers around creating a complete experience. So when it comes to entertaining, he focuses on, well’Äîeverything. To create this sensational whole, Bruce takes care that each part’Äîwine, food, ambiance’Äîis exceptional in its own right, and then perfectly in tune with the others. If Bruce has one goal it is to share the wine country lifestyle, showing people how to bring it into their own lives no matter where they live. He has taught both wine industry leaders and aspiring wine connoisseurs, in offices, restaurants, and college classrooms. He always begins with the essential elements of food and wine, and from that foundation offers a whole new approach to dining, entertaining, and daily living. For instance, his innovative approach offers a method of balancing flavors to pair wine and food perfectly, and you need not be a wine expert to use it. All that's required are common ingredients from the cupboard and a curious set of taste buds. For years California's wine country has been a symbol of "the good life." With Bruce Riezenman's insight, now that good life can be yours.